New York: Associated Music Publishers, 1949 32, 8 pp. Piano-vocal score in Spanish and French for medium voice with 8 pp. vocal only score in English. "Sole American Issue of the original Eschig edition." PO sig. and some dates penciled throughout. Corners bumped, else fine. The songs: El Pano Moruno; Seguidilla Murciana; Asturiana; Jota; Nana (Lullaby); Cancion; Polo. Wraps. Very Good. 4to - over 9¾" - 12" tall:. New York: Dover, 1995 xix, 183 pp. Quarto, for voice and piano. Fine, with a slight rub at bottom of spine, text block clean and white. Texts in German, Eichendorff-Lieder also include English words ; English translations of Goethe-Lieder printed separately as texts. Glossary of German musical instructions used in music. ''This . . . edition, . . . is a new compilation of the following songs, originally published in four separate collections by C.F. Peters, Leipzig, n.d.: Gedichte von J. von Eichendorff fur eine Singstimme und Klavier von Hugo Wolff / Original-ausgabe: Volume I [Eichendorff songs nos. 1-10] and Volume II [Nos. 11-20]; and Gedichte von Goethe . . . 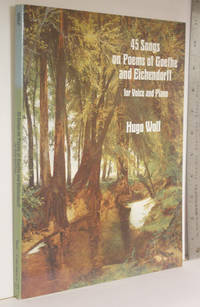 (etc., as above): Volume II [Goethe songs nos. 12-18 and 49-51] and Volume IV [Nos. 34-48].'' English translations of Eichendorff by John Bernhoff ; English translations of Goethe by Stanley Appelbaum. Eichendorff songs, Nos. 1-20 (complete). Der Freund [The friend] ; Der Musikant [The wandering minstrel] ; Verschwiegene Liebe [Silent love] ; Das Standchen [The aged minstrel] ; Der Soldat I [The soldier, I] ; Der Soldat II [The soldier, II] ; Die Zigeunerin [The Gipsy-maid]; Nachtzauber [Night's glory] ; Der Schreckenberger [Captain Dreadnaught] ; Der Glucksritter [Dame Fortune's knight] ; Lieber alles [I'd rather] ; Heimweh [Longing for home] ; Der Scholar [The itinerant scholar] ; Der verzweifelte Liebhaber [The despairing lover] ; Unfall [Mishap] ; Liebesgluck [The bliss of love] ; Seemanns Abschied [The sailor's farewell] ; Erwartung [Waiting] ; Die Nacht [Night] ; Waldmadchen [Forest-nymph]; Goethe songs, Nos. 12-18, Nos. 34-51. Ritter Kurts Brautfahrt [Sir Kurt's bridal journey] ; Gutmann und Gutweib [Goodman and Goodwife] ; Cophtisches Lied I [Song of the Great Copt, I]; Cophtisches Lied II [Song of the Great Copt, II] ; Frech und froh I [Impudent and merry, I] ; Frech und froh II [Impudent and merry, II] ; Beherzigung [A reflection] ; Ob der Koran von Ewigkeit sei? [Is the Koran eternal?] ; Trunken mussen wir alle sein! [We must be drunk!] ; So lang man nuchtern ist [As long as a man is sober] ; Sie haben wegen der Trunkenheit [They have complained about our drunkenness] ; Was in der Schenke waren heute [What commotions there were in the inn today] ; Nicht Gelegenheit macht Diebe [It is not opportunity that makes the thief] ; Hoch begluckt in deiner Liebe [Deeply blessed by your love] ; Als ich auf dem Euphrat schiffte [As I was boating on the Euphrates] ; Dies zu deuten bin erbotig! [I am ready to interpret this!] ; Hatt ich irgend wohl Bedenken [Would I have any reservations?] ; Komm, Liebchen, komm! [Come, darling come!] ; Wie sollt ich heiter bleiben [How am I to remain cheerful?] ; Wenn ich dein gedenke [When I think of you] ; Locken, haltet mich gefangen [Tresses, keep me captive] ; Nimmer will ich dich verlieren! [I never want to lose you! ]; Prometheus [Prometheus] ; Ganymed [Ganymede] ; Grenzen der Menschheit [Limitations of humanity].. Wraps. Fine. 9"x 11''. New York: Dover, 1995 xiii, 142 pp. 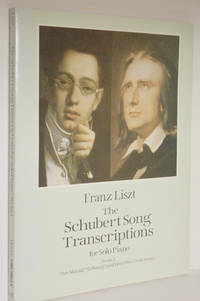 Includes interlinear words in German; texts of the songs in German with English translations printed preceding each transcription. ''Reproduced from the 1838 Diabelli edition.'' 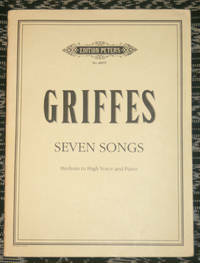 Contents: Sey mir gegrusst; Auf dem Wasser zu singen; Du bist der Ruh; Erlkonig; Meerestille; Die junge Nonne; Fruhlingsglaube; Gretchen am Spinnrade; Standchen von Shakespeare; Rastlose Liebe; Der Wanderer; Ave Maria : Hymne an die Jungfrau.. Wraps. Fine. 9" x 11''. New York: Dover, 1995 xix, 102 pp. Small folio, with beautifully illustrated wraps. Very light wear to edges of wraps, else fine. Originally published: Paris, 1870-1911. 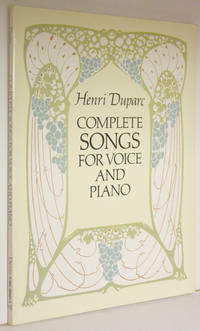 Includes La fuite, duet for soprano, tenor, and piano. Includes words printed separately as texts with English translations, p. xi-xviii. Contents: Au pays ouse fait la guerre [To the land where war is being fought]; Chanson triste [Sad song]; Elegie [Elegy]; Extase [Ecstasy]; Lamento [Lament]; La vague et la cloche [The wave and the bell]; La vie anterieure [My previous life]; Le galop [The gallop]; Le manoir de Rosemonde [Rosemonde's manor]; L'invitation au voyage [Invitation to a voyage]; Phidyle; Romance de Mignon [Mignon's song]; Serenade [Serenade]; Serenade Florentine [Florentine serenade]; Soupir [Sigh]; Testament; La fuite [The flight].. Wraps. Near Fine. Folio 12'' X 9''. New York: Dover, 1996 x, 171 pp. Facsimile. Contents: 1: Die winterreise. 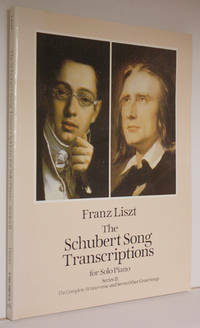 2: Franz Schubert's Geistliche Lieder. 3: La rose. 4: Lob der Thranen. 5: Die Forelle [The Trout]. 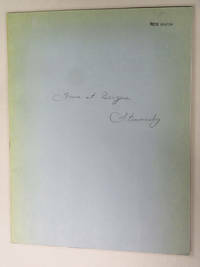 ''Reproduced from early editions, 1835-1846.''. Wraps. Fine. 9" x 11''. New York: G. Schirmer, 1948 85 pp. glossy b&w frontis of Anderson. Light wear to edges of wraps, PO sig., some light pencil marks throughout, mostly circled page numbers, but a few breath marks, and ritardandi. Songs: Ahle: Brunstiges Verlangen; Bach: Jesu schlaft, was soll Ich hoffen? ; Hande Te Deum; Haydn: Das Leben ist ein Traum; Hook: Bright Phoebus; Mozart: Als Luise die Briefe ihres ungetruen Liebhabers verbrannte; Beethoven: Vom Tode; Schubert: Ave Maria, Suleika, Der Jungling und der Tod; Schumann: Stille Tranen; Franck: Recitative and Aria of the Archangel, from the Poeme-Symphonie ''Redemption''; Brahms: Auf dem See; Faure: Automne; Wolf: In dem Schatten miener Locken; Griffes: Night on ways unknown has fallen; Payne (arr.Spiritual): Crucifixion; Boatner (arr.Spiritual): Oh, What a beautiful City; Johnson (arr.Spirituals): Fix me Jesus, Roll, Jerd'n, Roll!. Wraps. Very Good. 4to - over 9¾" - 12" tall. New York: Henmar Press, 1986. 29 pp.Edition Peters No. 66937. 1. Two Birds Flew into the Sunset Glow (Roumanian folk text); Les Ballons (Oscar Wilde); In the Harem (Chu Ching-yu); The Water Lily (John B. Tabb); Phantoms (Tabb); Pierrot (Sara Teasdale); Cleopatra to the Asp (Tabb). Edited by Donna K. Anderson. Duration: ca. 13 minutes. New York: Hanmar Press, 1986. "Against these turbid turquoise skies / The light and luminous balloons / Dip and drift like satin moons, / Drift like silken butterflies."--Wilde. "Pierrot stands in the garden / Beneath a waning moon, / And on his lute he fashions / A little silver tune."--Teasdale. . Wraps. Very Good. 4to - over 9¾" - 12" tall.